For the youngest patriot, there is always American flag girls' clothing to be found. Whether you want a T-shirt, long-sleeved shirt or shorts, the right item is there to allow a girl to proudly show her colors. 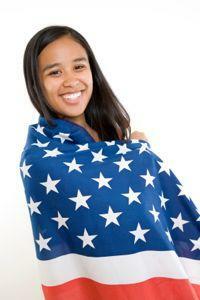 It used to be considered disrespectful to wear patterns of the actual American flag as clothing. Instead, on holidays such as the Fourth of July, Memorial Day and even Labor Day, people would show their patriotism by incorporating the colors red, white and blue in their outfits. Even Election Day was considered a time to dress with the flag in mind. Children did not necessarily get into the red, white and blue, although they were of course dressed up for the major holidays. On the Fourth of July, girls traditionally wore their best summer dresses. They might carry small flags, but the habit of dressing in clothes festooned with the actual flag itself is not something seen until the 1960s. When it was first used, American flag girls' clothing was considered ironic - it was teenagers who incorporated the flag as part of their statement about what America had become. Gradually, however, more and more clothes were manufactured with the flag pattern. Now it's hard to go to an Independence Day parade and find anyone who isn't sporting the flag on their outfit. Since most American flag girls' clothing consists of loose fitting summer wear such as T-shirts and oversized tops, it can be easier to shop for them online. At Flag and Banner, they have several selections. Their unisex American flag T-shirt features a vertical design with a blue square and three stars on the upper right breast and red and white stripes covering the rest of the torso. The left sleeve is also in blue and the collar trim is white. The stars are appliquéd to add texture to the shirt, which is in a comfortable cotton knit. They come in sizes from small to extra-large and there are matching adult tees as well, so that the whole family can dress in unison. You can also get nylon walking shorts for kids. One leg is blue with three appliquéd stars, the other leg sports red and white stripes. These come in sizes from small to extra-large. For cooler weather, you can get a nylon jacket. It features the appliquéd stars and, like the T-shirt, the opposite sleeve is also blue. It has a white lining and zips up the front. If you want American flag clothing suitable for exercising, you can get nylon pants that match the jacket. If you just want a patriotic look for a single holiday, you don't have to buy a shirt or shorts that might only be worn once or twice. Instead, a girl can show her patriotism through a little creativity. A blue shirt from a thrift shop can have stars painted on, with the rest of the outfit in red and white. If you're really into fabric painting, you can get a white tee and create an entire flag on it, or you can use craft items like red velvet ribbons and blue felt to create the desired effect. Flags found at craft shops can be pinned to clothing or turned into fun head gear. Many girls love to arrange actual flags in pigtails or ponytails, especially as these will ripple in the breeze. No matter what, the spirit of the day will definitely be captured.